This morning the BEA released its final regularly scheduled revision to Q3 GDP. Overall, growth was revised down by 15 bps to 3.35% QoQ SAAR. That’s a slower growth rate than the 4.15% QoQ SAAR in Q2 but hardly a weak pace. 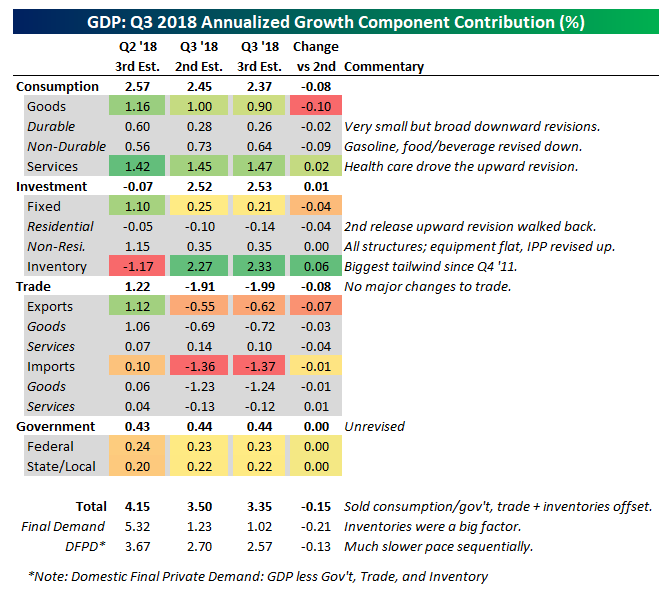 The consumer continues to spend at a solid pace, government spending is lifting growth, and while fixed investment slowed it’s still performing reasonably well. On the other hand, housing continues to weigh on growth, and much of the sequential gain this quarter was driven by rapid inventory expansion. Typically, surging inventories would be a very negative sign, but there are two factors moderating the signal in their rapid rise in Q3. First, they’re largely offsetting crashing exports, with both inventory builds and exports likely to mean revert in Q4, at least at the margin. Second, inventory levels are very, very low relative to robust final demand, so several quarters of strong growth in inventories would be justified by final demand. We should also note that corporate profits are growing at a steady pace. After-tax profits are somewhat distorted by huge corporate tax cuts at the end of last year, but pre-tax profits rose 3.5% QoQ (+10.4% YoY). That’s the fastest sequential growth rate since Q2 of 2014 and second-fastest since 2011.